E.O. Wilson has made a tremendous contribution to our understanding of biodiversity, while his insights on social and group behavior have changed our perception of ourselves. The stirring keynotes from this legendary Harvard biologist are both majestic overtures to all life on earth as well as eloquent pleas to government, corporate, and religious leaders to address the damage we have done to our planet. 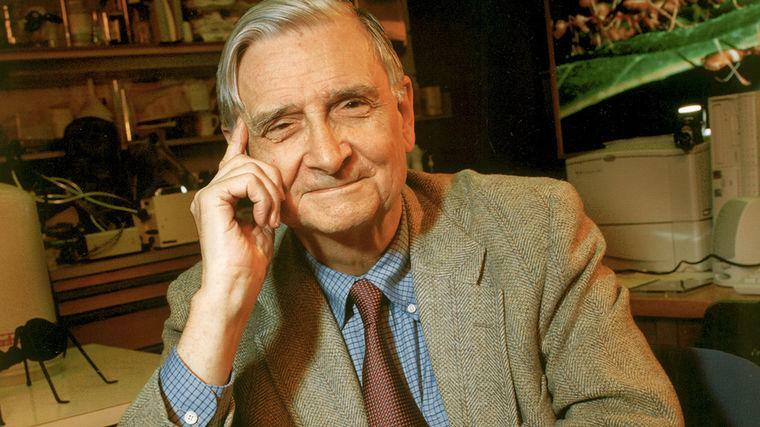 Edward O. Wilson is widely considered the father of the modern environmental movement. Wilson’s latest book, Letters to a Young Scientist, offers advice and perspective from a lifetime of scientific work. It has been released to much fanfare, including this review from Bill Streever of The New York Times Book Review: “I want to express my gratitude. Thank you for reminding me and thousands of others why we became ­scientists.” Named one of America’s 25 Most Influential People by TIME magazine, and a two-time Pulitzer Prize winner, he has made a giant contribution to our understanding of the rich spectrum of Earth’s biodiversity. In his lectures, he makes a persuasive, eloquent plea to government, corporate, and religious leaders to address environmental destruction before it’s too late. His 32nd book, The Origins of Creativity is a philosophical and scientific analysis of creativity: specifically, how it makes us human. Wilson’s many other works include Ants and On Human Nature, which both won the Pulitzer Prize; The Future of Life, which offers a plan for saving Earth’s biological heritage; Consilience, which draws together the sciences, humanities, and the arts into a broad study of human knowledge; The Creation, a plea for science and religion to work together to save the planet; and From So Simple a Beginning, a collection of the four seminal works of Darwin, with his own original introduction. His book The Superorganism was hailed by The New York Times as "an astonishing account of the intricate and unexpected swarm intelligence of wasps, bees, ants and termites," and The Social Conquest of Earth, a groundbreaking book on evolution, was a New York Times bestseller. In 2014, Wilson released three titles: the National Book Award nominee The Meaning of Human Existence, the stunning book of photography and prose A Window on Eternity, and Letters to a Young Scientist. One of Wilson’s recent projects, The Encyclopedia of Life website, catalogs all key information about life on our planet—including data about every living species—and makes it accessible to everyone, anywhere. Launched with compensation from his 2007 TED Prize, the Encyclopedia of Life recently received an additional ten million dollars from The MacArthur Foundation. Wilson is also the recipient of the U.S. National Medal of Science, the Crafoord Prize (a sister to the Nobel Prize), and the Audubon Medal. He is the University Research Professor Emeritus at Harvard University, and continues to research at the Museum of Comparative Zoology. Recently, Wilson teamed with Harrison Ford to create a new PEN Literary award titled the PEN/E.O. Wilson Award for Literary Science Writing. In order to stave off the mass extinction of species, including our own, we must race to preserve the biodiversity of our planet, says Edward O. Wilson. He argues that the situation facing us is too large to be solved piecemeal and proposes a solution commensurate with the problem’s magnitude: dedicate half the surface of the Earth to nature. If we are to undertake such an ambitious endeavor, we first must understand just what the biosphere is, why it’s essential to our survival, and the manifold threats now facing it. In this keynote, Wilson describes how our species, in a blink of geological time, became the architects and rulers of this epoch, and outlines how this will affect all of life far into the future. He provides an enormously moving portrait of just what is being lost, documenting ongoing extinctions and paying tribute to creatures great and small. He considers not only large animals and star species of plants but also the millions of invertebrate animals and microorganisms that, despite being overlooked, form the foundations of Earth’s ecosystems. And in stinging language, he avers that the biosphere does not belong to us, addressing many fallacious notions. This includes a critique of “anthropocenists,” a fashionable collection of revisionists who believe that the human species alone can be saved through engineering and technology. Despite the Earth’s parlous condition, Wilson is no doomsayer, resigned to fatalism. Defying prevailing wisdom, he suggests that we still have time to put aside half the Earth and identifies actual spots where Earth’s biodiversity can still be reclaimed. Suffused with a profound Darwinian understanding of our planet’s fragility, Wilson’s keynote reverberates with urgency like few others, but still offers an attainable goal that we can strive for on behalf of all life. In this lecture, E.O. Wilson guides you through Darwin’s four masterworks, including The Origin of Species, weaving together the thrilling story of Darwin’s groundbreaking discoveries, and placing his evolutionary concepts in the context of scientific and historical thought, from the nineteenth century to the present day. Wilson also examines contemporary biological thought—how the state of evolution is faring in an era of religious resistance—and looks forward to the future of biology, a period that his own work, from his Pulitzer Prize-winning books to his Encyclopedia of Life website, has made immeasurably richer. Edward O. Wilson brings elements from each of his books into his talks; think of his body of work as a continuous investigation into the wondrous nature of science, humanity, and our planet. In this hopeful speech, based on The Creation, he argues that science and religion must join forces: the earth’s destruction threatens us all—no matter what we believe about its origins. Early Reviews: Edward O. Wilson's New Book "Commands Attention"
Washington Post Rounds up the Year's Best Books; Three Are By Lavin Speakers.